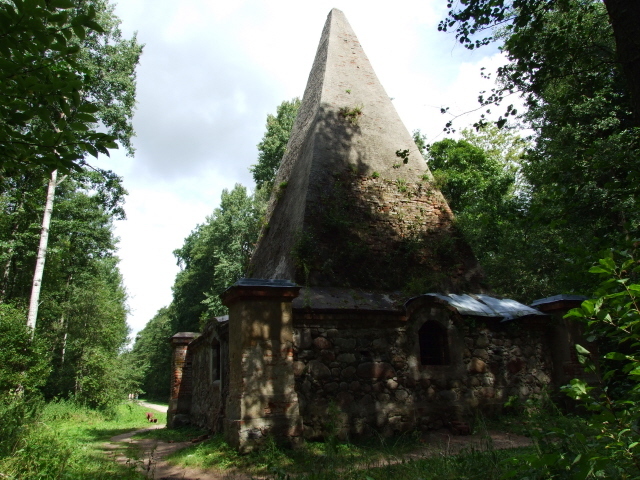 An isolated mausoleum in the form of a (steep) pyramid, originally built for the von Fahrenheid family in the 19th century. 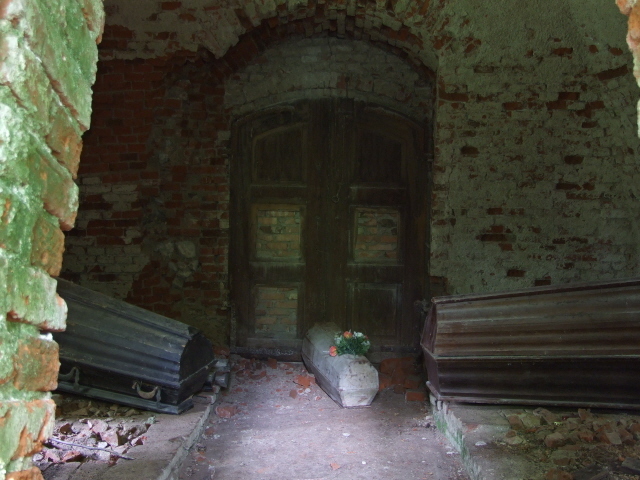 You can peek into the interior to catch a glimpse of the coffins. 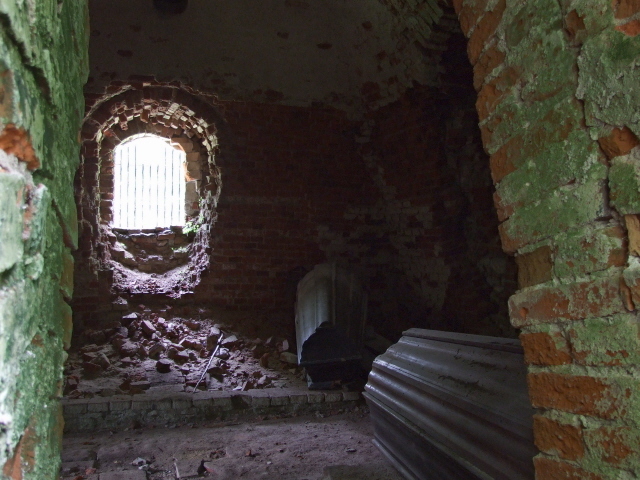 A peculiar dark folly worth a detour when touring the north-east of Poland. More background info: Information to be found about this place is very sparse, but I managed to dig up the following: the pyramid was apparently built for an official in Imperial East Prussia (when this corner of Poland was part of Germany), namely a certain Heinrich von Fa(h)renheid (spellings and first names given, vary). He was apparently also an art collector with a special interest in Egyptology – hence the pyramid shape … apart from its supposed mystical qualities. It was first intended for von Fahrenheid's granddaughter who died aged only three years in 1811, later other family members were laid to rest here too. The monument was damaged in World War II, by the Soviet Red Army, so the allegation goes, but has since been (partly) restored – though not especially well. The structure is still partly overgrown on the outside and the interior looks dusty and dilapidated, with broken bricks lying about. The doors have been bricked up, so you can only peek inside through the barred window openings. What there is to see: Not all that much – apart from the unusual exterior of the mausoleum it's the fact that you can glance inside that makes this isolated monument additionally 'dark' in nature, and hence occasionally mentioned on the Internet. 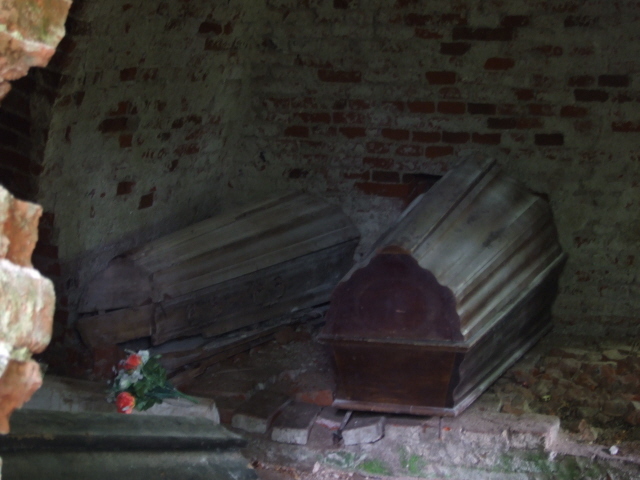 However, when I visited in August 2008, I could not make out the open coffin(s) with the mummified (headless!) corpse, as has been described in some Internet resources. There were only three or four closed coffins visible, one of them clearly a child's coffin – with a bouquet of plastic flowers on it. You have to wonder how they got there, given that the doors are bricked up and the windows have bars. There's also a small plaque (in Polish only) by the approach to the pyramid giving some historical details. Even though there isn't that much to it, the place does have a strange and somewhat morbid 'aura', also given that it is so isolated, just a stone's throw away from the northern border of Poland with the Russian enclave of Kaliningrad. It's no longer as totally obscure as it is sometimes made out to be – it's clearly been incorporated into the tourist development efforts of the area in recent years and even appears in local brochures. Location: in north-eastern Poland, near the village of Rapa, which is right on the Russian border (of the Kaliningrad enclave), roughly halfway between the towns of Goldap to the east and Wegorzewo (formerly Angerburg) to the west. Access and costs: fairly remote; inexpensive. Details: To get to this forlorn spot you really need to have your own vehicle, although determined cyclists staying in the area could contemplate it as an excursion too. The easiest approach is from the Wegorzewo-Goldap road (the 650), at Banie Mazurskie turn off towards Rapa (signposted). Straight ahead through the woods, you'll reach a sign for the pyramid some five miles from the main road. You can't park right at the approach path to the mausoleum but you get to a car park just a hundred yards or so past it – where you get ushered in and charged a small fee (3 zloty in August 2008). You pay at a small hut that also sells some souvenirs – they are clearly trying to generate a little revenue from the (still few) tourists who come here; and who could blame them for it in this otherwise poor and underdeveloped area. 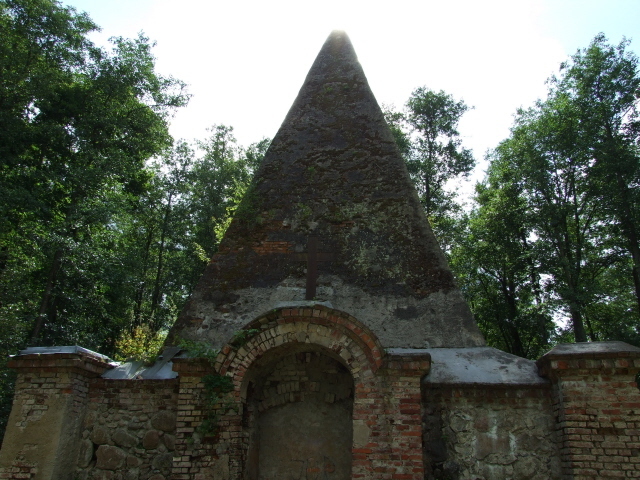 So when a little boy "offered" his services of "guiding" us to the pyramid (even though it would have been easy enough to find without his help) this was also worth a couple of extra zloty as a "tip" … Access to the pyramid as such is (still) free, after all. You reach it after you've been "shown to" the beginning of a straight woodland path, lined by nature trail text plaques and a few benches. Time required: Looking at the pyramid and peeking inside doesn't take more than a few minutes. Getting there is a greater factor time-wise. If you're on the Wegorzewo-to-Goldap road anyway, taking in the detour to the Rapa pyramid only adds about half an hour to the itinerary. As an excursion from Gierloz, say (see Wolfschanze), you should allow some two to three hours for the round trip. Combinations with other dark destinations: The Rapa pyramid is indeed best combined with other dark destinations in north-eastern Poland, as it would hardly be worth the journey in its own right. 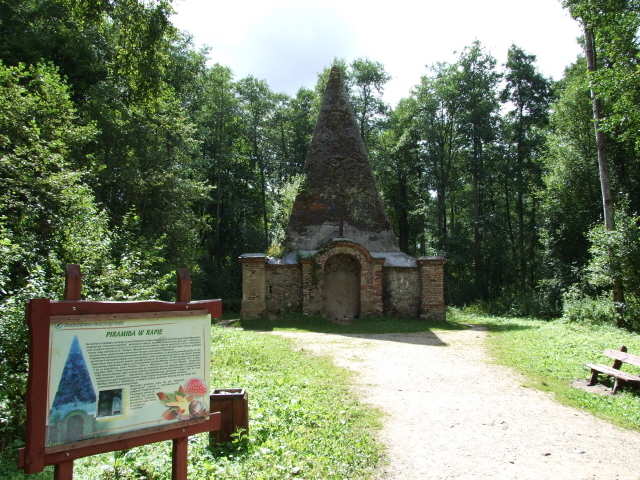 The main major point of dark tourism interest in this area is definitely the Wolfschanze (Wolf's Lair) near Gierloz. Rapa is roughly 40 miles (60 km) to the north-east from there (part of the way on narrow, slower roads). It could best be incorporated into a day's driving when travelling on to (or from) Suwalki in the very far east of Poland, another 55 miles (90 km) or so away. Suwalki in turn is only some 20 miles (30 km) from the border with Lithuania, with Grutas Park being a combinable excursion from Suwalki or en route to Vilnius. See also Poland in general. Combinations with non-dark destinations: Rapa is just north of some of the most picturesque of the Masurian Lakes, which in general are one of Poland's top tourist draws – mostly for nature lovers, water sports enthusiasts (canoeists in particular) and families. Thus the area is well developed for tourism, but that means it can get quite crowded in peak season. There are also some pretty towns (Mikolajki usually gets top marks in that respect) and historical sites such as castles, churches and monasteries. See also Poland in general.